Strikeout. Goose eggs. Whatever you choose to call it, a skunk by any other name still stinks. And I’m no stranger to defeat, especially when visiting the evil and cold-hearted temptress known as the Yakima River. Because of that I’m always looking for something to increase my odds of success reduce my odds of failure. Shy of power bait, I’ve not come up with many solutions. However, I recently stumbled upon (not using Stumbleupon.com, mind you, but rather just surfing the old-fashioned way) something I felt compelled to share with the ten of you. Something about this pattern stinks. The image comes from a website titled, PikeFlyFishingArticles.com. Now, I’m not a pike fisherman. Never even seen one of those toothy critters, although I did fish the lower Bitterroot River this summer, where Pike are known to be found. I did not find one. But to say I got skunked while pike fishing would not be accurate, either. We were fishing for trout, in water that just happened to also have pike. I did not get skunked while trout fishing, fyi. One look at the “Feathered BW Streamer” tells me two things: First, while descriptive, it was misnamed; and secondly, it looks like a pattern that would catch fish. Big fish. After all, it takes a big fish to munch on an animal the size of a skunk. Even a baby skunk would be a mouthful for all but the nastiest of carnivorous trouts, like, say, a Hawg Brown. 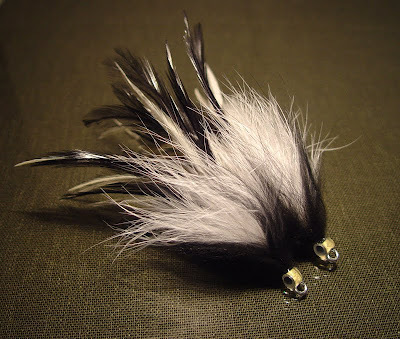 I realize that using artificial scent on an artificial fly is either illegal (depending on regulations) or at the very least frowned heavily upon, but a little dab of something from the south end of a skunk would really be icing on the cake when fishing with the Skunk Express “Feathered BW Streamer”. Luckily you won’t have to go out and harvest the stuff yourself–you can buy it in a bottle. I imagine you wouldn’t want to spill this stuff in your waders, so be careful when you use it. The best way to fight fire is with fire. The same should work for fending off a skunk, right?